Following my journey through Japan at the tail end of 2014/beginning of 2015, I treated myself to a shopping spree in Tokyo's RC stores. 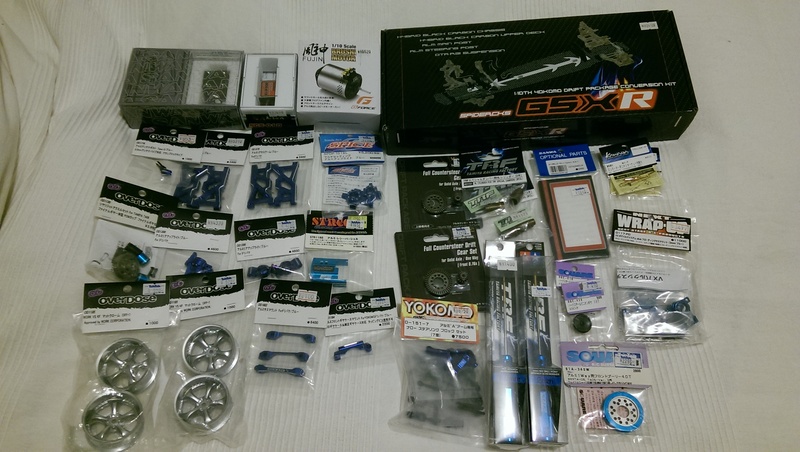 Alongside some general upgrades and bits and bobs, the major purchase was a Kazama GSX-R conversion kit for my WUN FR-D and parts to suit. It's very low profile, taking a lot of inspiration from modern touring car concepts like floating servo and narrow chassis. It also ditches the 2.5mm hinge pin system in favour of the more common and arguably more durable 3mm system. Initially I bought a WUN open gear case as OD's were out of stock everywhere. Since then, I managed to pick one up on a rare restock and have subbed it in for the open equivalent. Regardless of which, the WUN open gear case as a very nice piece, looking elegant on otherwise chunky-looking Doripake's. For knuckles, I used some unusual Spice KPI's. These cost around 3500Yen and are something I haven't seen online. They use MST-style stub axles and are very well finished. Tolerances are good and fit and finish is exemplary. I do have a few issues with the top KPI mounting area as it can bind ith your steering linkage at full lock, but otherwise they have served me well. Kazama's top deck is outrageously flexible and doesn't seem to offer any particularly noticeable stiffness/resistance. 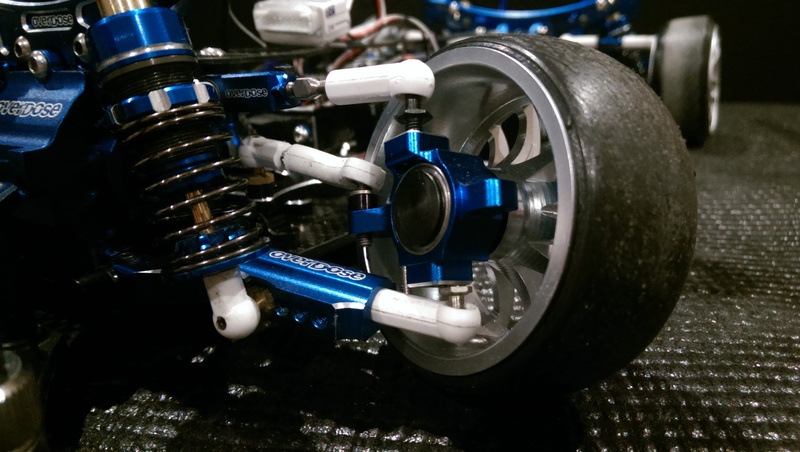 Completing the shocks with some Kazama adustable tops. 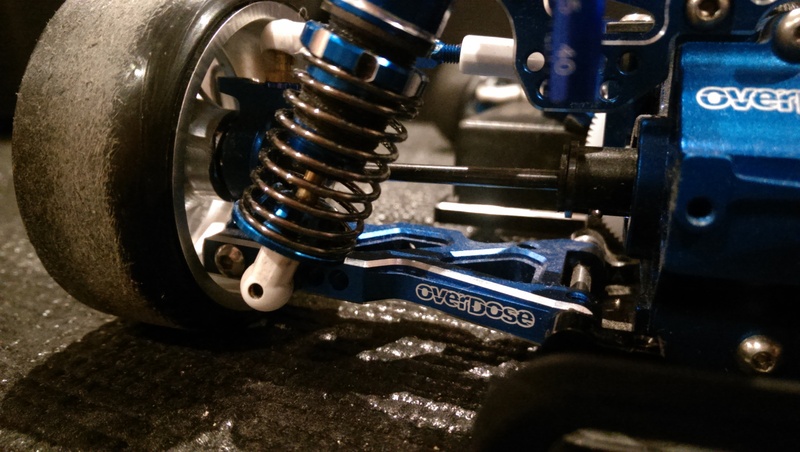 OverDose's quick remove spur holder has been very useful but still somewhat fiddly. 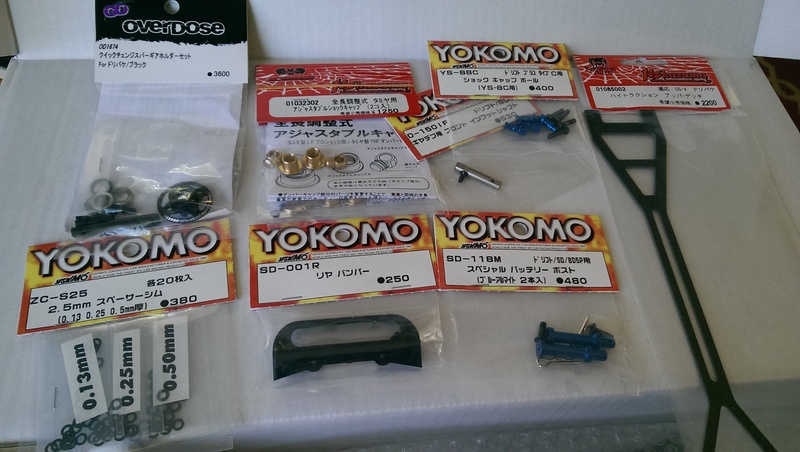 Still, it's an improvement over the existing yokomo solutions. Not pictured: Kazama springs and OD's bumper plate. I was able to recover some OD type C upper arms which had a broken turnbuckle stuck in them to replace the poor-fitting WUN versions. 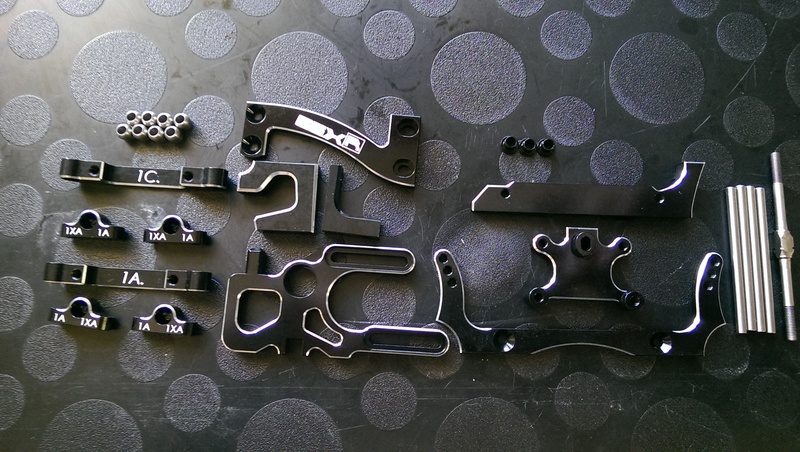 The battery retainer is located on the battery tray holder for the Kazama GSX-R as per the low profile-chassis. I had to make a bit of a bodge modification with some spare parts to solve this issue. However, I did remove this in favour of a different solution. 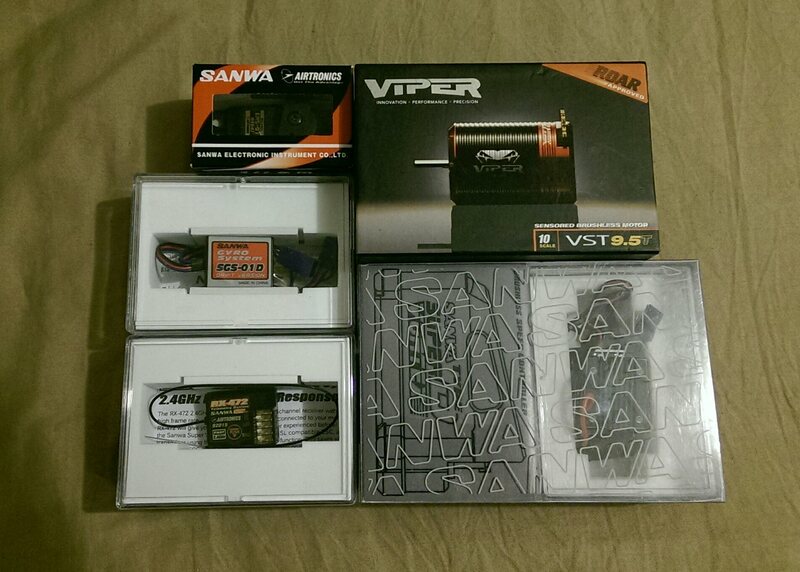 I claimed some half-price Sanwa products in japan. Sanwa Super Vortex Type-D and Sanwa's drift gyro. Combined with an rx-472 or SSL connectivity, sanwa servo and a 9.5T (now 6.5T) Viper Motor. 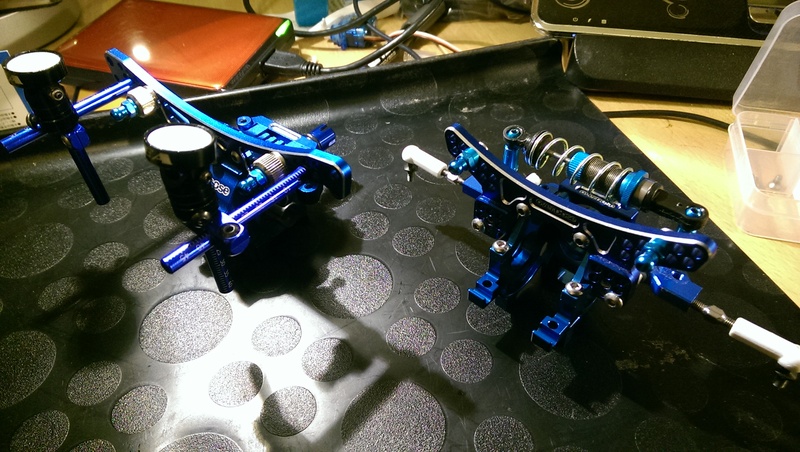 I have been tinkering and fiddling with this for getting on a year now since I built it in early February 2015. It's now my main RWD chassis' and has become a very enjoyable car to own, tune and drive. Currently complete in it's current form. You'll have to excuse the wiring as I've just installed a new ob1 light kit onto my new Team Samurai FC3S shell and the module as wreaked havoc here. 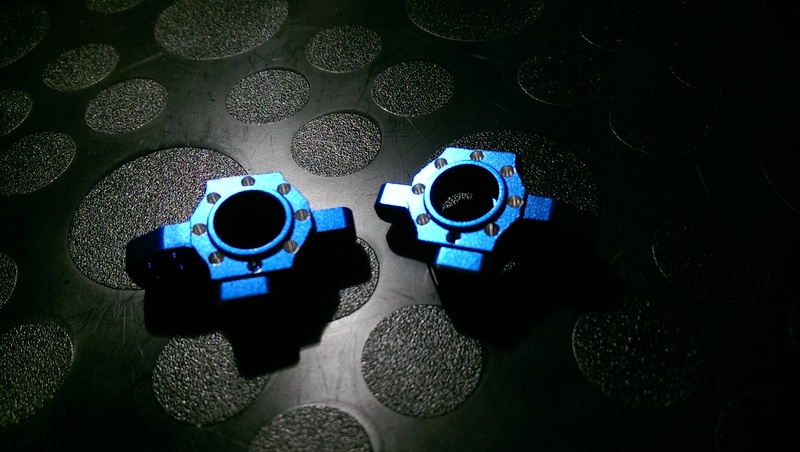 The Spice knuckles are doing a good job and match the colour of the OD dark blue perfectly. 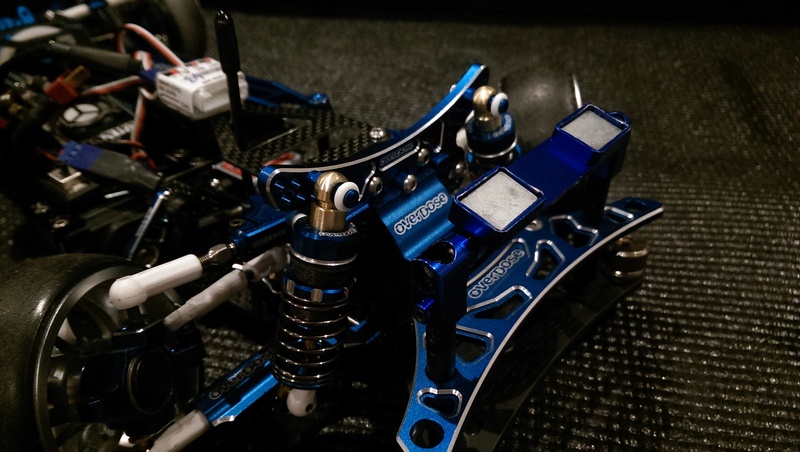 Lock is adequate and all turnbuckle ends have been replaced for Yokomo ones to ensure better fit and finish. 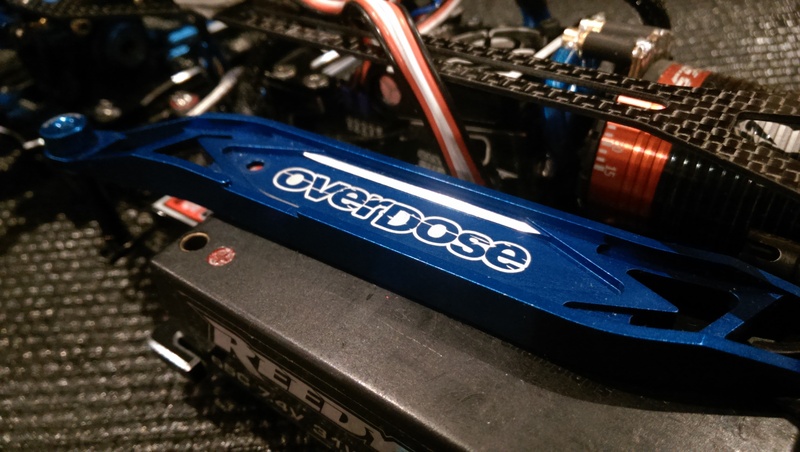 I finally got the OD gearcase and OD bumper plate. They definitely look the piece. 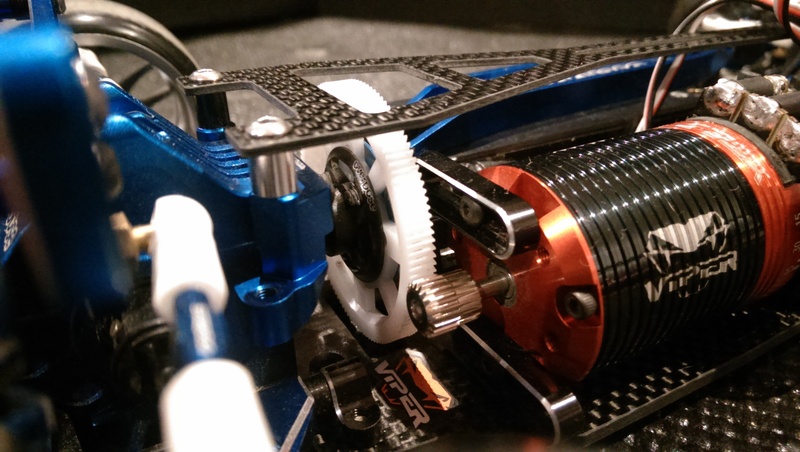 The Viper motor performs well, meshing through a 20/116 64p pinion/spur setup. 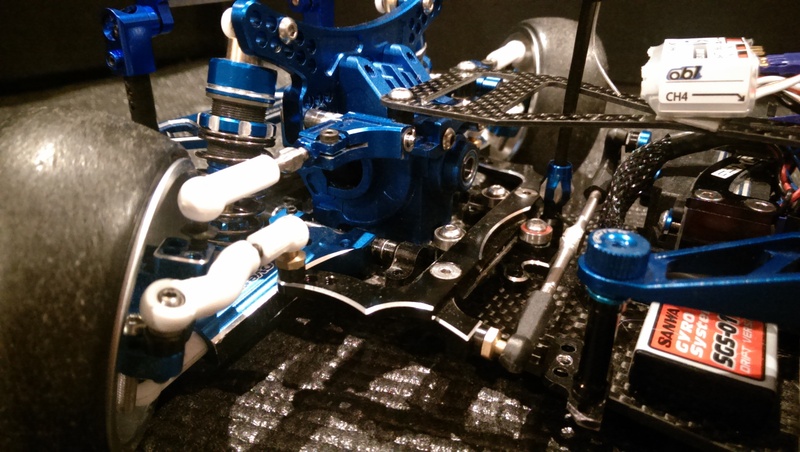 There is a yokomo underdrive kit in the gearbox as well and a plastic/stock DP ball diff. Usually I retain the OD shaft and OD shaft cups just for bling purposes but have removed them in these photos. Rear suspension got an upgrade from the previous Active adjustable setup to OverDose (courtesy of Japan). The lower arms offer great shock positioning and are finished in classic OD style. Unfortunately, I could not spend $30+ on OD hubs, so i'm just using a mix of Oxygen and Streetjam. The kazama slide rack is a thing of beauty. The geometry i also very good and it is reasonably smooth. Options are good and it's easy to put together. Downsides are it's reliability. The bearings are operating at a mechanical insufficiency so any significant forces pushing the rack up or down can cause it to pop out and damage the running edges. It's a problem that becomes worse with repeated damage. Now using shorty packs only. I have used some WUN FR-D battery retainers and double-side-tape'd them down. It gives room for the gyro. Overall: Apologies for the dodgy photos, my DSLR is out of action currently and my phone camera had to suffice. The Kazama GSX-R is a very nice and clean conversion kit. It gives the traditionally chunky doripake an air of refinement and slimness. 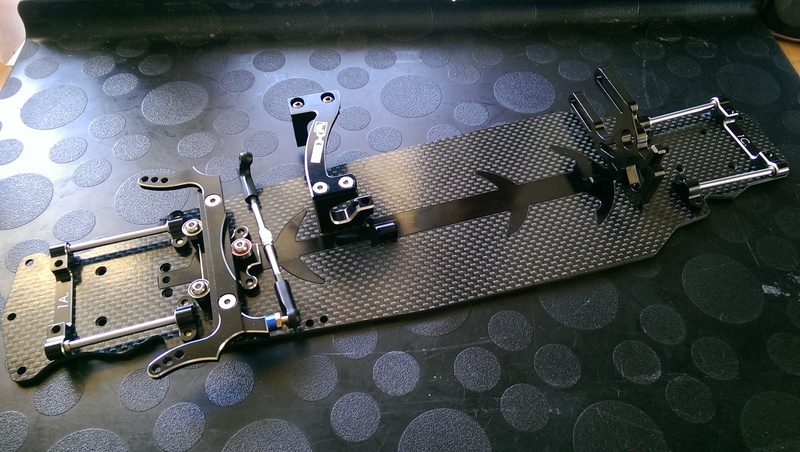 It's also considerably better value than the OD DP carbon chassis kit as you get more standard and have to buy less later. However, OD purests will unlikely enjoy the lost opportunity for more OD bits. the fit and finish is generally superb and a joy to work on. The top deck isn't that well designed for OD parts, but if you use the recommended Kazama stuff, it's no issues to mount. I just had to raise it by about 6mm to clear the spur gear. There is a new beefier-looking top deck available from kazama. The thin/flexible top deck (featured here) is also rubbish for sticking modules/gyros to as the flex will help them fall off and the lack of surface area for mounting starts you off on the wrong foot anyhow. OverDose's top type C arms are a lot better than WUN's type-C versions as they have bearings and significantly less slop/play. 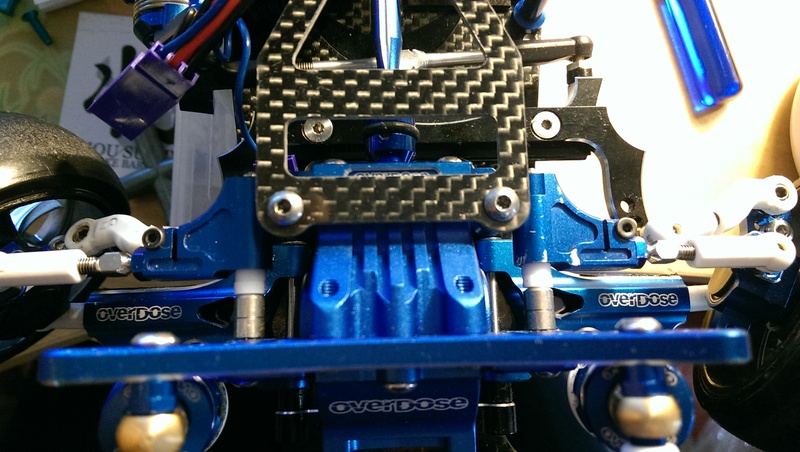 The OD lower front arms are not the greatest as they are very beefy and lack further-in shock mounting options. 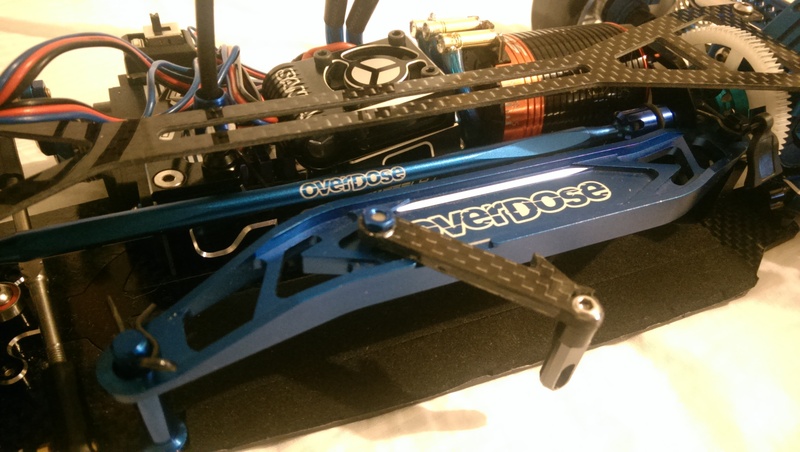 OD's servo saver, in classic fashion, is rubbish. I have the V2 in dark blue and it brings in a lot of play and slop. My friends' have experimented with the V3 and also found it to be too sloppy. I replaced it with a Sanwa direct horn. 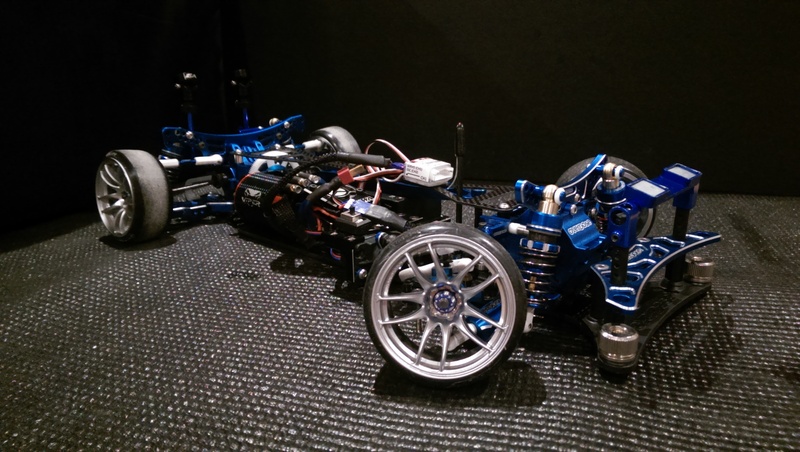 The space around the chassis can be quite claustrophobic if you have it traditionally setup (long pack, motor, servo, esc, receiver all in normal positions). The moment you go to a shorty pack/other new battery mounting options, you get a lot more freedom with mounting electronics. Conclusion: Turning FR-D into DP has been a joy. I have to say I haven't looked back, even when this current form wasn't working RWD well. 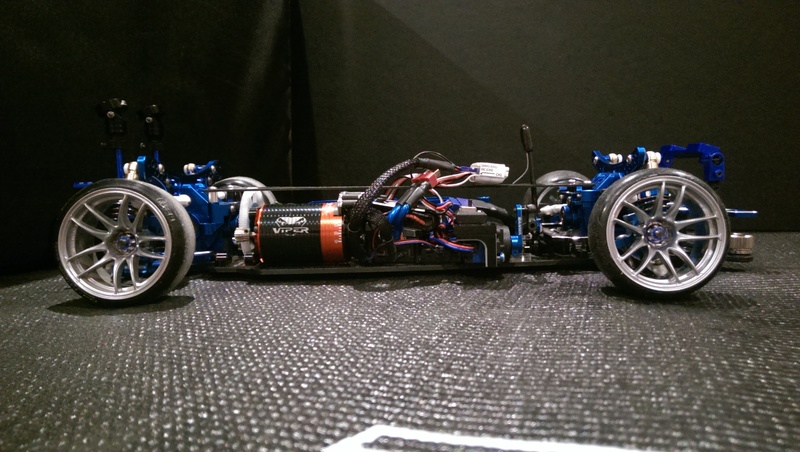 Since improvements in tuning and setup, the car has been very reliable and easy to maintain. It's also a very attractive piece.